Before and after are the css pseudo elements which are used to add content just before and after the content of the element. It is used to add some content just before the content of the element. 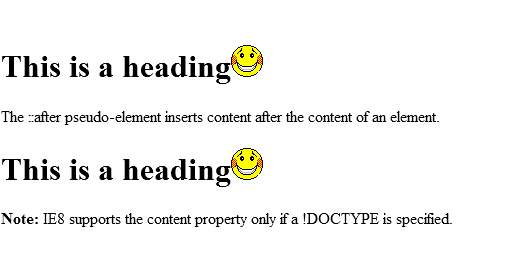 When you execute this code, you will see a smiley just before the heading which is inserted by using before element. It is used to add some content just after the content of the element. When you execute this code, you will see a smiley just after the heading which is inserted by using after element. Two Colon(::) mean Pseudo Element and Single Colon(:) Mean Pseudo Class.